Gorge Net » Managed WiFi: Mobile App Tour | Life. Business. Uninterrupted. Anything an eero user needs to do can be done through the eero app. Below are the two general starting points, the Dashboard and the App Menu. The eero Dashboard is the starting point when opening the app. From here, users can choose what they’d like to check, manage, and troubleshoot on their eero network. 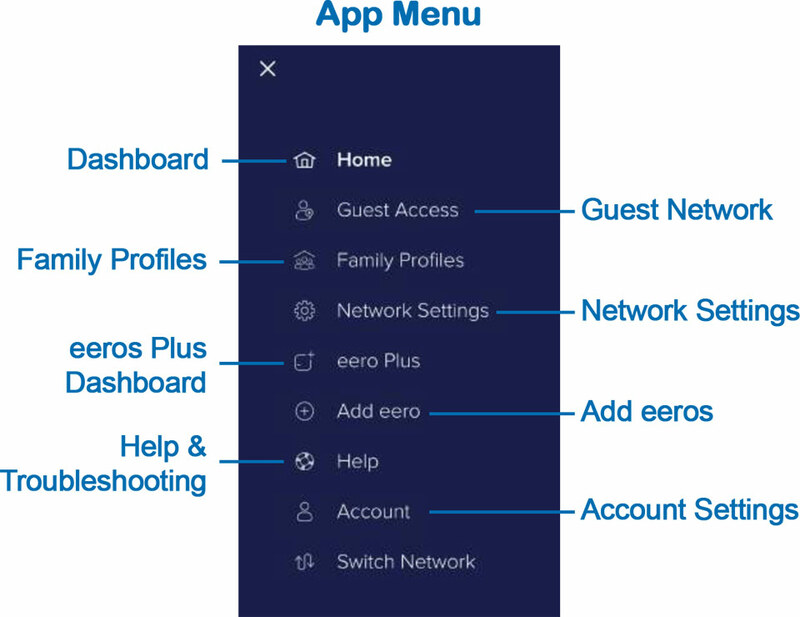 From the App Menu, eero users can navigate to many of the features including guest networks, Family Profiles, settings, and eero Plus. At the top of the Dashboard, users are able to check the status of their network. This message will inform them whether their network is healthy, experiencing an issue with any eeros, or offline. This status means that everything on the network is looking good. All the eeros at the bottom of the dashboard will be highlighted in green. If the network has recently been updated, restarted, or a change has been made, the network will display that it is connecting to the internet. During this time, features such as connected device information and running a speed test are unavailable. If a user sees the message to check a specific eero on their network or multiple eeros, their network is still online but the eeros mentioned/highlighted in red need attention. The issue can be that they are out of range, unplugged from power, or potentially experiencing a technical issue. When the status shows that the network can’t reach the internet, it means that the gateway eero is unable to get online. In this scenario, users should ensure their eero is correctly connected to the modem and/or powered on. At this time, the user should also check to see whether or not there is a network outage. At the bottom of the dashboard, users can view and access their network speed test results. 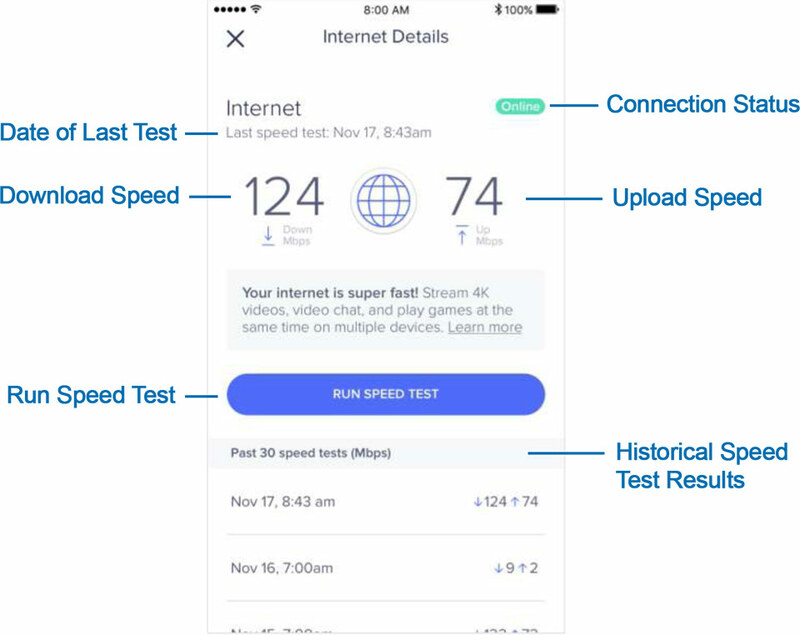 To launch the Internet Details screen, the user will need to tap on the speed test section. Once open, users can run speed tests to check their download and upload speeds. If an eero network is offline, it won’t be possible to run a speed test. A user can still view the results of their past 30 tests, but everything else will be greyed out and unavailble until the network is able to return online. 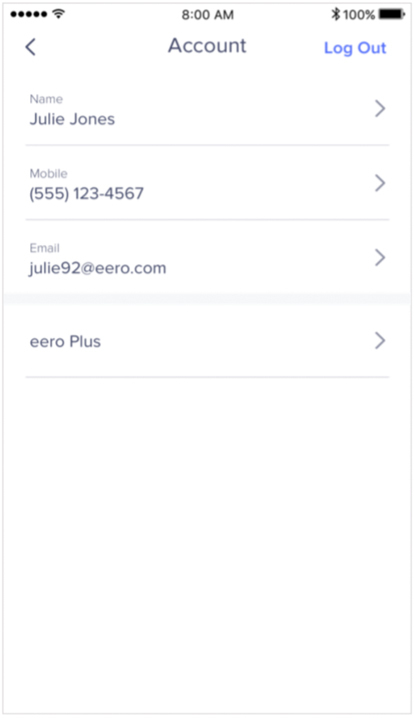 From the eero app, users can manage their eeros. This includes checking their status, restarting individual eeros, changing the LED state, and removal. 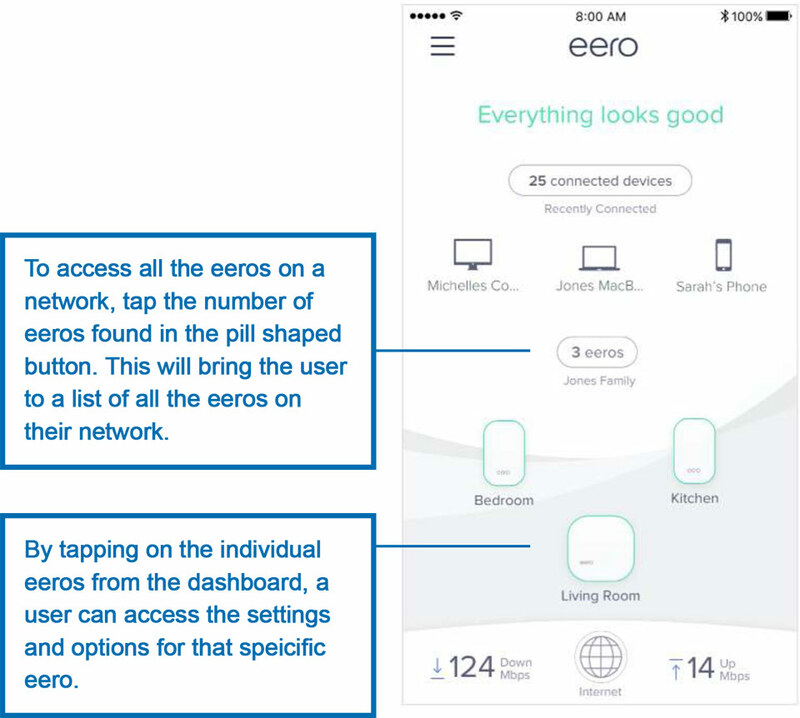 Through the app, users can access information on their eero, as well as take certain actions such as managing the LED/nightlight and restarting or removing their eero. 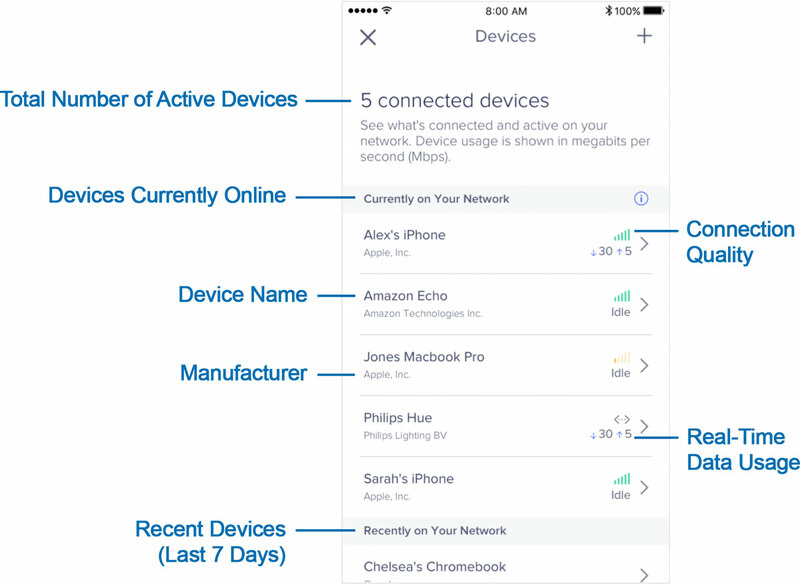 This section represents the online status of the eero or eero Beacon. The connection type that an eero has to the network. Wireless eeros also have a health status represented by five (5) bars. This will be the name given to the eero based on its location in the home. The name can be changed at anytime by tapping into the next page. From here, the user can toggle their eero’s LED on/off. eero Beacon only — From here, the user can decide on the nightlight setting for each Beacon on the network. The device’s current IP address. 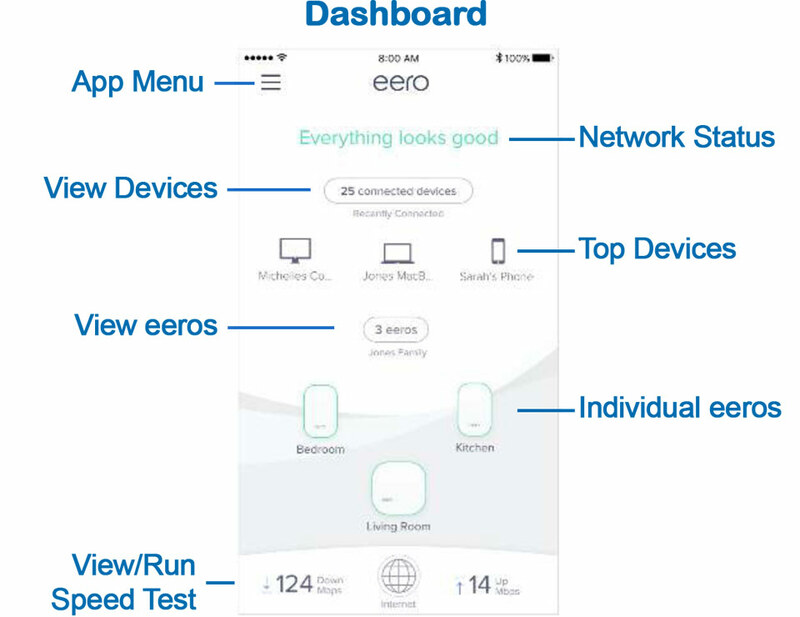 The version of the eero software currently on the eero. All the details on the eero, including model name and number, serial number, and the Ethernet port MAC addresses. Used to restart an individual eero as long as the eero is online. Used to remove an individual eero. Removing the gateway eero will delete the entire network. 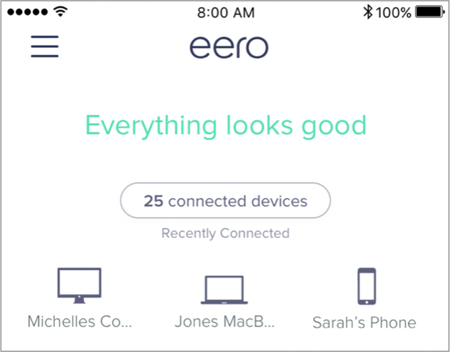 The eero app is designed to easily manage and view all the connected devices on a network. In order for a device to join a network, it will need be added using the WiFi credentials or via an Ethernet cord. Through the connected devices button. It will be labeled with the number of devices on a network. 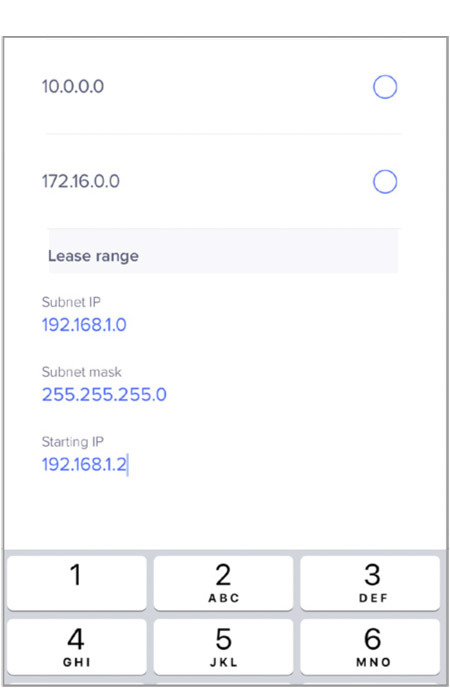 By tapping on one of the recently connected top devices on the network. The name given to the device. By default, this will be null. If the device is connected to any Family Profile, it will be displayed here. The user can also change the profile by tapping into the menu. When a device is connected to the network, it will display the type of connection (wireless/wired), the quality of that connection, as well as what frequency it is on (2.4/5GHz). Wired devices will be identified as such. This is the eero that the device is currently connected to. Here the user can see the real-time data usage of the device. This is the name given to the device. The IP address given to the device. The MAC address of the device. If a device is unrecognized, the user has the ability to block it from the network. A guest network is a great way to let users share their network with their guests in their home. The guest network will allow guest devices to connect to the internet, while keeping them securely isolated from the main network. 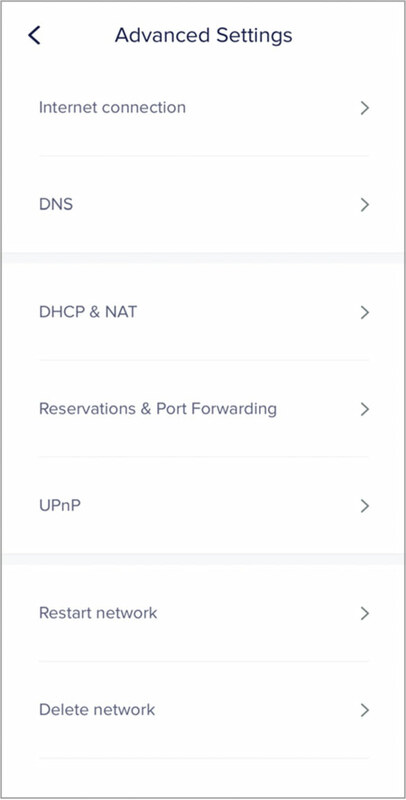 To change the settings of the guest network, tap on Guest Access from the app menu. This toggle turns the guest network on/off. This is the network that guests will join. By default, it will take the name of the main network and add Guest to the end. However, the guest network name can be edited to anything. This is the password a guest will need to use to access the guest network. By default, it will be something random, but just like with the network name, it can be edited to anything. 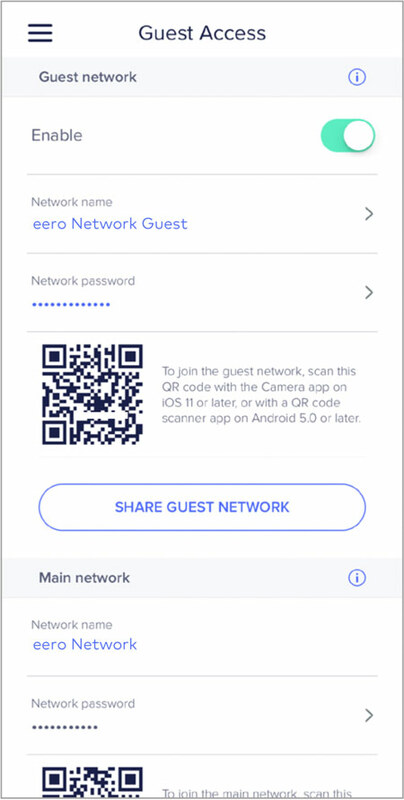 If the guest has a device that supports it, they can scan the unique QR code to automatically join your network. A user can also easily share their network with their guests by tapping the Share Guest Network button. This will prompt them to share the network information via text, email, etc. The guest network will only be available as long as the toggle is enabled. If the toggle is turned off, or the network name or password is changed, any connected guests will immediately lose connection to the network. 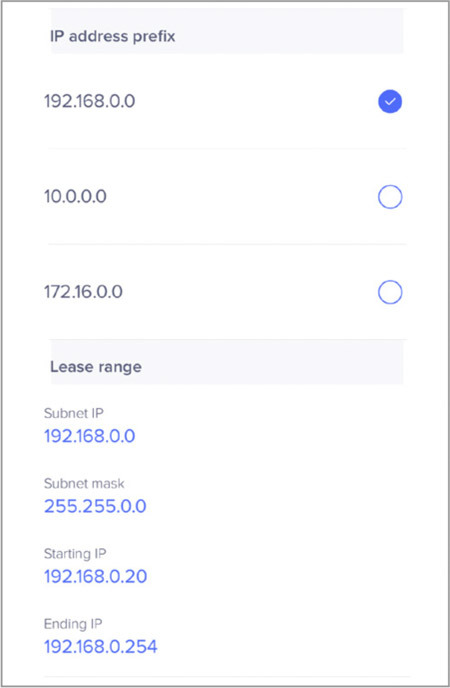 From the Network Settings screen, a users will be able to see all current network configurations, and make direct changes to them as desired. Below is walk-through of navigating this page. This is the SSID (name) of the user’s main network. They can change it by tapping through. This the password for the user’s main network. They can change it by tapping through. From here, the user can sign up for eero Plus. 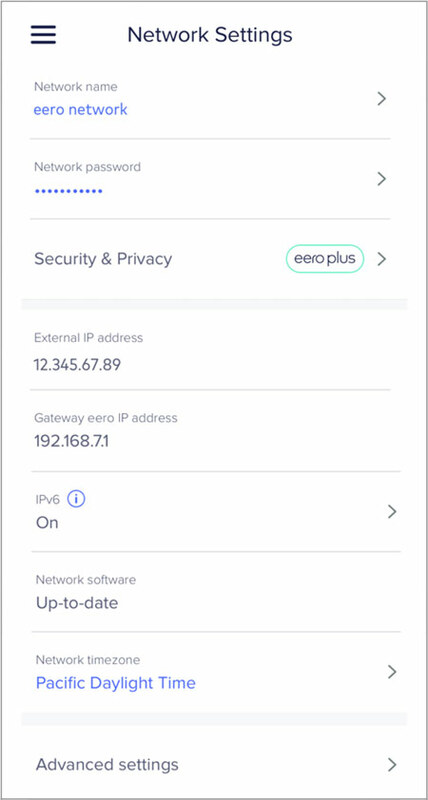 If eero Plus is enabled on ther user’s network, they can tap through to turn on the networkwide security settings such as Advanced Security and Ad-Blocking. This is the gateway eero’s WAN IP address. This is the gateway eero’s LAN IP address. From here, the user can see if their network software is up-to-date or if there is an update available. If a user would like to further customize their eero network, they can do so through the Advanced Settings screen. 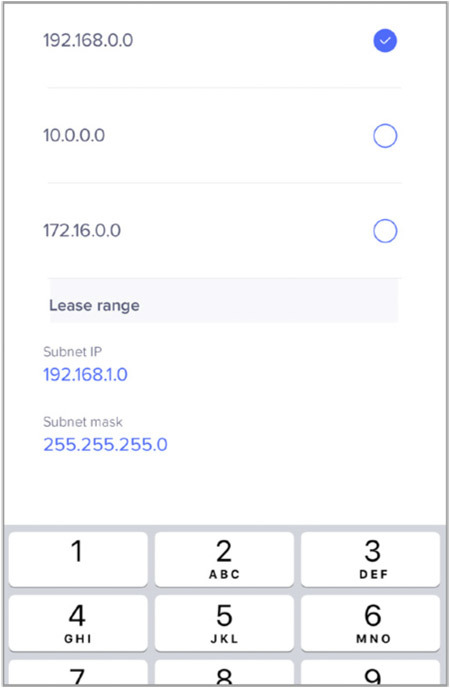 ISP (default): The IP address, subnet mask, and router IP address will all be set by the ISP. This is where the Domain Name Servers (DNS) can be configured and are used for translating domain names, such as facebook.com, into IP addresses so they can be reached. Users can either use the one distributed by their ISP or choose a custom one (such as Google DNS or OpenDNS). When eero Plus is enabled, a user won’t be able to change their DNS as they need to use eero Plus’s specific hardcoded DNS. Automatic (recommended): eero automatically chooses the best settings for the network. Should be 192.168.1.0 for our example. 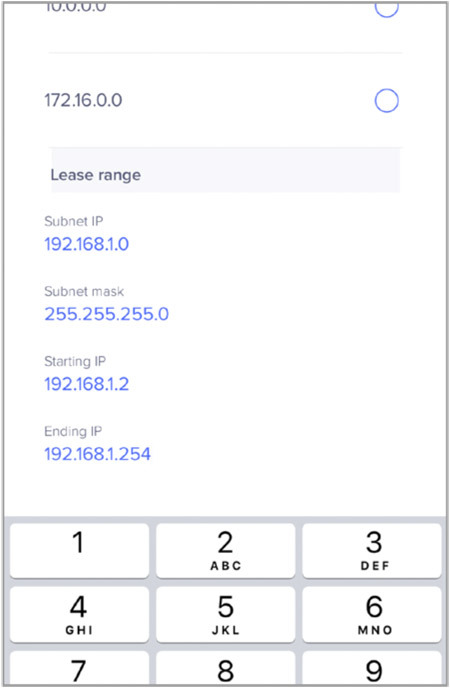 To make any changes, tap on the last digits of the subnet. 3. Bridge: In bridge mode, the upstream router will provide all the network settings. 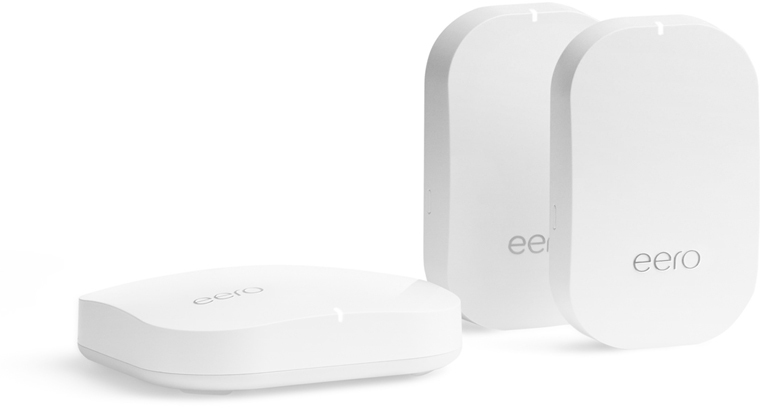 While eero routers will continue to work as a mesh, many advanced features will not be available to the user. Users can use IP reservations to allow them to keep the same IP address for a particular device. This means the device will always have the same IP address. 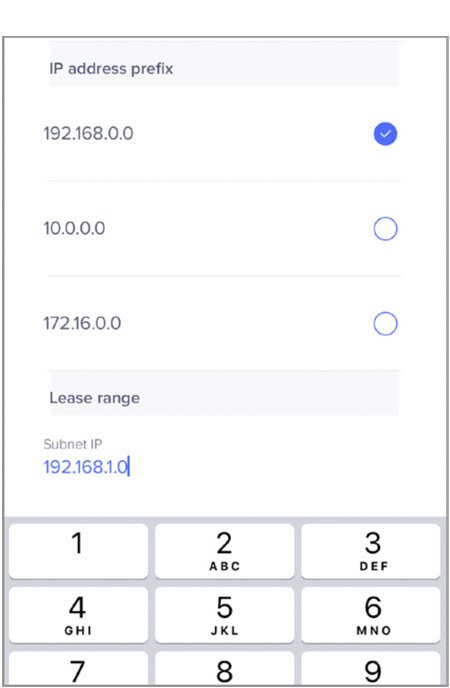 Users also have the option to setup port forwards, which is helpful when a device or application requires direct connections to other devices or services on the Internet..
Once an IP reservation has been created, the user can set a port forward. Universal Plug and Play (UPnP) is a way to allow devices like game consoles and media centers to to open ports to the internet automatically. This can be enabled by switching the toggle to on. 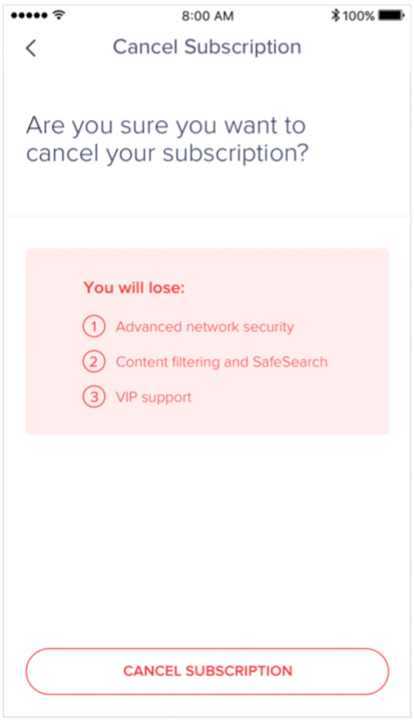 If a user would like to restart their network (for example, they feel their network is being slow), they can do so through the app as long as they have an active internet connection. If a user would like to delete their entire network, including all settings and remove all eeros from their network, they can do so by following the network deletion steps. 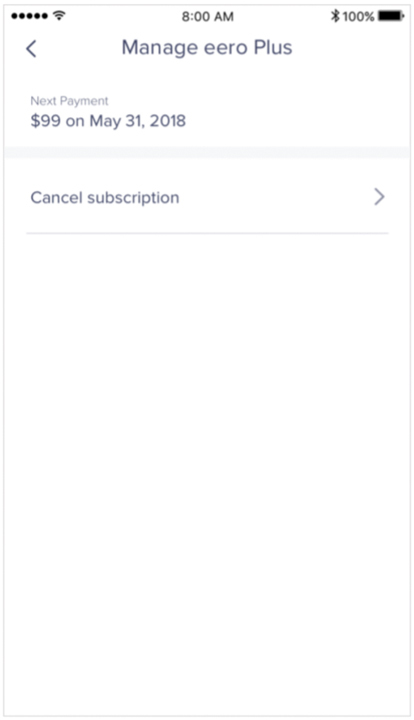 In order to use the eero app, a user will need to have an account. This contains all the information including their name, phone number, and email. All of this information is used to identify the network, as well as allow the user to log into their account and access their network. 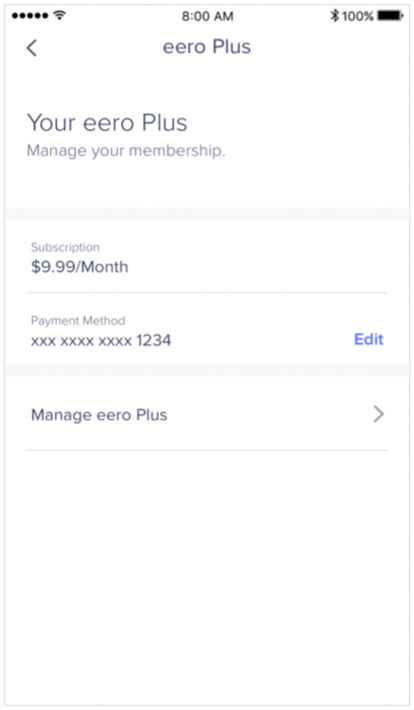 From the Account screen, users can also manage their eero Plus membership. This includes signing up, canceling, and reactivating their account.